Hooks, beak, ink, jet propulsion and a collapsable body -- the squid is certainly anatomically unusual. While the squid is arguably best known for his ability to squirt ink and fit his body into tiny nooks, his arms play a huge part in his evolutionary success. The arms, of which there are eight, are distinct from tentacles, of which there are two. The squid is highly articulate. With 10 limbs, it’s no surprise that he can grapple with and capture his prey quite easily. The arms of the squid are muscular and, depending on the size of the squid, they can also be extremely powerful. In fact, much of the squid’s strength is in his arms. The colossal squid (Mesonychoteuthis hamiltoni), for example, has arms of up to 1.5 meters in length, although the arms are always of unequal size. The arms, which are shorter than the tentacles, are adorned with powerful suckers. The arm suckers, which are circular and line the entire length of the limb, are much larger and more powerful than the suckers on the tentacles. The suckers enable the squid to hold the prey with one arm while he moves the other arms around to get a better grip. As well as suckers, the squid’s arm is equipped with hooks. Unlike the hooks on the tentacles, the hooks on the arm do not rotate. They are therefore less versatile, although quite deadly nonetheless. Set in a double row along the length of the arm, the hooks are fixed in place by a muscular sheath. Once captured, the hooks themselves may kill, or at the very least, injure the prey, before the squid uses his beak to chop and slice his prey, ready for eating. As well as making the squid a formidable predator, one squid has evolved to use his arms for an unusual kind of self defense. The arms of the deep sea Octopoteuthis deletron species will break off from his body if he becomes entangled or believes he under threat. This is the only squid known to have this ability. 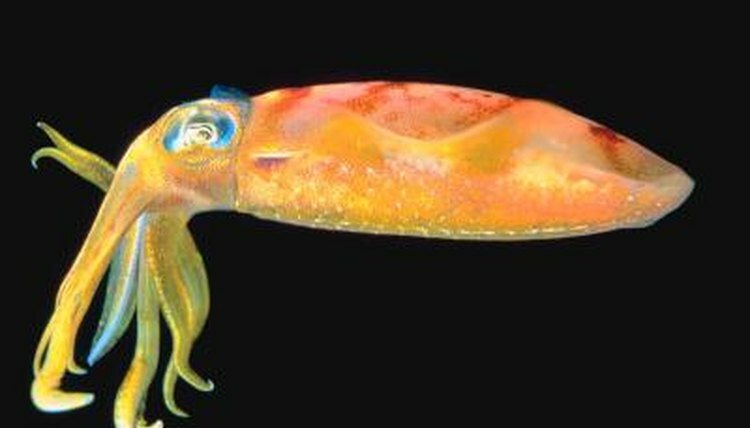 Instead of losing potentially valuable time by releasing its suckers and shaking off the other creature from its hooks, this squid simply tears off its own arm to get away. The squid has two tentacles and eight arms. The tentacles are typically equal in length to one another, while the arms are not. Furthermore, the tentacles are much longer than the arms and are used mainly for reaching out. Once the prey is in reach of the tentacles, the squid uses them to bring it within reach of the arms. The tentacles have rotating hooks, while the arms have static hooks. The hooks on the tentacles can swivel 360 degrees.